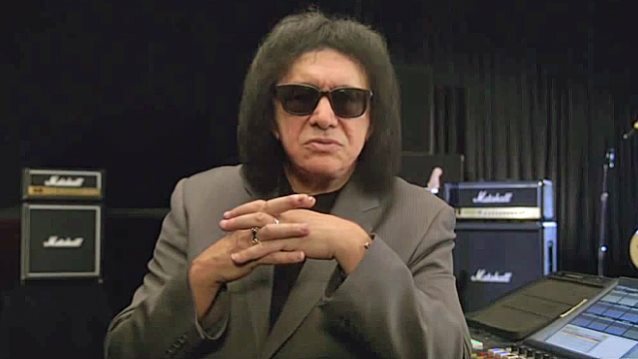 Gene Simmons says that he writes new music "all the time" but insists that the business is dead for anybody but the established artists. Although KISS hasn't released a studio album since 2012's "Monster", frontman Paul Stanley said last fall that a follow-up effort was on the way. Asked by Doug Podell of Detroit's 94.7 WCSX radio station if there is an incentive for KISS to make new records considering that direct music sales play a significantly diminished role compared to a couple of decades ago, Simmons said (hear audio below): "The business is dead. Not for us — we can continue to tour, and THE [ROLLING] STONES can continue to play the songs everybody loves and so can Paul McCartney and stuff. But for a new band, it's dead. You have to give away your music for free, because generations of fans have been trained — shamefully — not to pay for music. Download, fileshare, view — I don't care what you call it — the truth is new bands don't have a chance." He continued: "In terms of writing, sure, I write all the time. In fact, a few weeks ago, [original KISS guitarist] Ace [Frehley] and I sat down and we wrote two things for his next record, which is gonna be coming out whenever he says. So writing happens all the time, and in my box set, which is gonna come out — oh, I don't know — before the end of the year, there are gonna be hundreds of songs. But the actual business of it? No, it's dead. It's dead. Because the fans won't pay for music." Simmons also once again criticized RADIOHEAD for utilizing a pay-what-you-want model for its 2007 album "In Rainbows", saying: "There was an English band, very well respected. I don't wanna say their name, 'cause their fans get so upset. And I'm actually a fan of the band. And they decided to put out a brand new album on the Internet, and the headline was, 'Listen, there's no price for this. Just pay whatever you wanna pay, or don't pay anything at all.' They only did that once, because it doesn't work. If you can walk into a store and there's a sign up that says, 'You can have anything for free or pay whatever you want,' how long do you think that store would stay in business?" Gene's comments echo those made by Stanley, who last year said about the prospect of the band making a new album: "Well, it's a very conflicted subject. In one sense, there's no reason to put out any new music. Because the delivery systems that are available don't pay. We're in a situation now where artists have to take what they can get, as opposed to what they deserve. For me, it's more of a moral issue than anything else, because I don't have to worry about paying the rent, but what about new bands?"